Julice Mound is an archaeological site in East Carroll Parish, Louisiana with a Plaquemine culture component dating to 1200–1541 CE and located less than one mile from Transylvania Mounds. The site is located less than a mile from Transylvania Mounds and it is extremely likely that Julice is part of that complex. 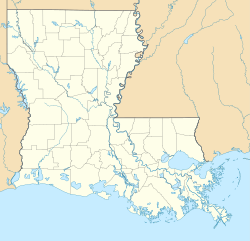 The site has a single platform mound and is located near a channel that feeds into the Mississippi River and right next to Louisiana Highway 581. A survey from 1954 describes it as being 8 feet (2.4 m) in height and having a small platform on its summit. The route for HWY 581 runs over the former location of a large section of the mound, of which only about one third remains and recent measurements of the mound put it at 9 feet (2.7 m) in height and 130 feet (40 m) by 65 feet (20 m) at its base. Pottery discovered at the site date its occupation to 1200–1541 CE. ^ a b "Indian Mounds of Northeast Louisiana : Julice Mound". Retrieved 2011-10-31. This page was last edited on 11 January 2018, at 03:40 (UTC).